Tara, the Bakersfield cat who was caught on video saving a boy from a dog attack, has been invited to “throw” the first pitch at a baseball game. Tara would appear at the next home game of the minor league team Bakersfield Blaze, its representatives said. “It sounds crazy. But we’ve got a trick up our sleeve,” team member Dan Besbris said, without giving further details. Tara became a YouTube sensation after saving four-year-old Jeremy Triantafilo from the neighbor’s dog attack. The California family’s CCTV video shows the dog biting and dragging the boy in a driveway in Bakersfield earlier this week. The cat then pounces on and chases away the dog, described as a Labrador-Chow mix. 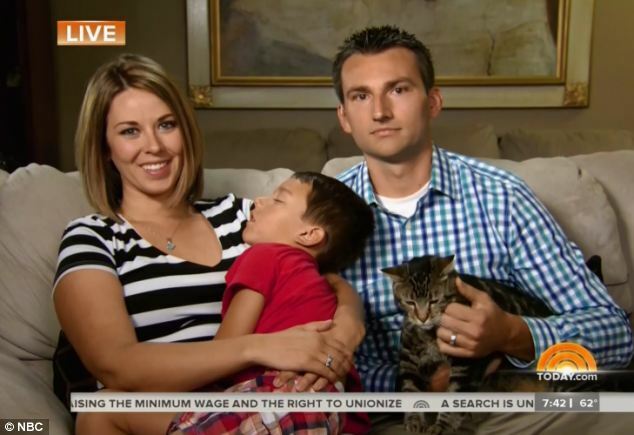 Jeremy Triantafilo – who needed stitches after the attack – praised his cat. The dog is now in quarantine and is expected to be put down.